Researchers at the New Brunswick Museum are reporting the largest bat population that hibernates in the province's caves has been wiped out by a deadly infection. Scientists say the white-nose fungus has rapidly killed millions of bats in North America and eventually humans will pay the price. Zoologist Don McAlpine of the New Brunswick Museum has been monitoring the bat’s cave in Albert County for the past two years. The population of the cave once numbered 6,000 but in the winter of 2011 infection moved in, critically reducing the bats' numbers. This spring, McAlpine said the cave is virtually empty, making the mortality at this particular site near 100 per cent. "During our last visit, which was a couple of weeks ago, there were five bats left and they were all infected," McAlpine said, "so, it appeared that none of those would survive." Researchers in Saint John are studying the white nose fungus to better understand why it causes bats to wake up early from their winter hibernation. Too early for insects, they die of starvation and exposure while searching for food. "The overall mortality for North America right now is estimated at between 5.7 and 6.7 million bats. The three species of bats we're dealing with here have actually recently been recommended for endangered species status. We're waiting for the federal minister to rule on that," McAlpine said. Environment Minister Peter Kent has not rendered a decision but scientists on the committee that made the recommendation said they hope he answers soon. Graham Forbes, with the Committee on the Status of Endangered Wildlife, is concerned the infection will spread to other species. "And the concern is, not only is it impacting the eastern half of the continent, but that it might jump to the Rocky Mountains and there's probably another five or six species of bats that would be just as vulnerable to this fungus as the three species we're concerned about in the eastern part of the country," Forbes told CBC News. In a January interview, McAlpine told CBC News the loss of bats could add billions of dollars to the cost of producing food since bats act as natural form of pest control. Bats prey on insects and insect populations can spike when the bats are gone. This could mean a loss in crops owing to the insects' voracious appetites or because of an increase in pesticide use. 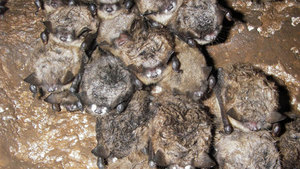 White-nose syndrome was first detected in a cave west of Albany, N.Y., in 2006. The disease is named for the white patches that appear on the muzzles and other body parts of hibernating bats. Bats can live between 30 and 35 years and have a relatively low birth rate, with only one offspring born every year, so it could take many years for the population to recover, scientists have said. In April, lab experiments led by biologists Lisa Warnecke and Craig Willis at the University of Winnipeg confirmed details of how the fungus kills the bats. The fungus is native to both North America and Europe, but recent changes in the environment or a genetic mutation have made the North American strain more deadly. The fungus is an invasive species in North America recently introduced from Europe, so European bats have immunity and North American bats do not. The researchers infected bats with either the European or the North American strain of the fungus and observed them during hibernation. "If we were dealing with a mutant in North America … we'd predict that the North American fungus should be way nastier for our bats than the European fungus," Willis said. "What we actually observed was the European version was even a little bit nastier." That is consistent with the fungus being an invasive species that has been able to sweep through a population with little immunity to the unfamiliar pathogen. "This thing is probably our fault," Willis said, "which to my mind means we have an obligation to try and figure out what's happening and hopefully fix it or… at least try to figure out ways to minimize the negative consequences." In the meantime, he said, it highlights the fact that people should be exceptionally careful about not carrying invasive species with them when they are moving from site to site while conducting research or caving recreationally. The lab experiments also confirmed scientists' previous hunches that the fungus can indeed make bats really sick, causing the bats to warm up and wake up during hibernation, depleting the fat stores they need to survive the winter. Bats normally conserve energy during hibernation by lowering their body temperature, but infected bats warmed up to normal body temperature three to four times more often as healthy bats toward the end of hibernation. After four months of hibernation, healthy bats still had lots of fat left, Willis said, but the infected bats "were in really rough shape." Some died on their own and others had to be put down. "They couldn't warm up from hibernation on their own," Willis said. "They were completely out of fat at that point."